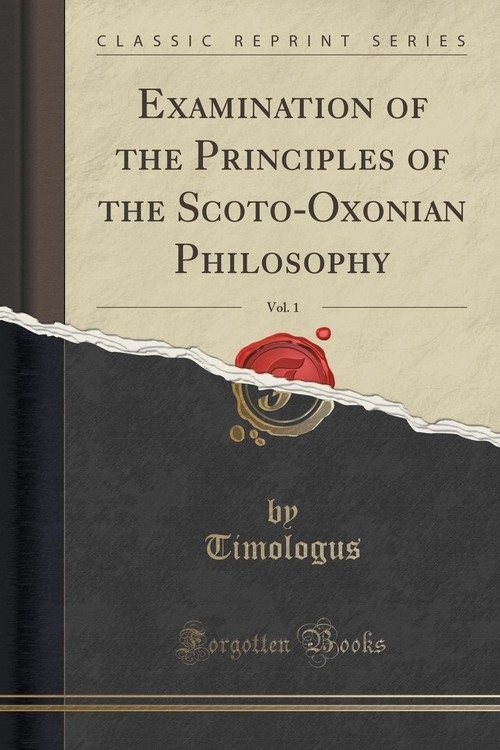 Excerpt from Examination of the Principles of the Scoto-Oxonian Philosophy, Vol. 1<br><br>It was the hope of Kant, that by his critic of the Reason, he had brought to light the source of speculative error, and shown the limits within which the human mind might profitably exercise itself, without further wasting its powers amid the bewildering perplexities of metaphysics. This hope, however, has been singularly falsified by the event. The very school which rose up under the powerful influence of his work speedily set aside the limits he had assigned to speculation, and rushed into the forbidden field with an audacity exceeding that which the predecessors of his critic had displayed.<br><br>Sir W. Hamilton has endeavoured to detect and signalise the errors which caused Kant&apos;s failure, and, by steering clear of these, to work out his design with more success.<br><br>About the Publisher<br><br>Forgotten Books publishes hundreds of thousands of rare and classic books. Find more at www.forgottenbooks.com<br><br>This book is a reproduction of an important historical work. Forgotten Books uses state-of-the-art technology to digitally reconstruct the work, preserving the original format whilst repairing imperfections present in the aged copy. In rare cases, an imperfection in the original, such as a blemish or missing page, may be replicated in our edition. We do, however, repair the vast majority of imperfections successfully; any imperfections that remain are intentionally left to preserve the state of such historical works.